Thank you to Blue Apron for sponsoring this post. Click here to get $50 off your first two weeks of Blue Apron, and share who you would cook for in the comments below! I’ve shared before that Matt is the one who does most of the dinner cooking around here. Ironic, I know, since I’m the one with the food blog! We get Blue Apron every week, so it’s easy for him to simply grab whatever recipe card catches his eye and get cooking while I get Riese to bed. No trying to figure out what to make or which ingredients to use because everything is ready and waiting for him. It’s a nice routine! 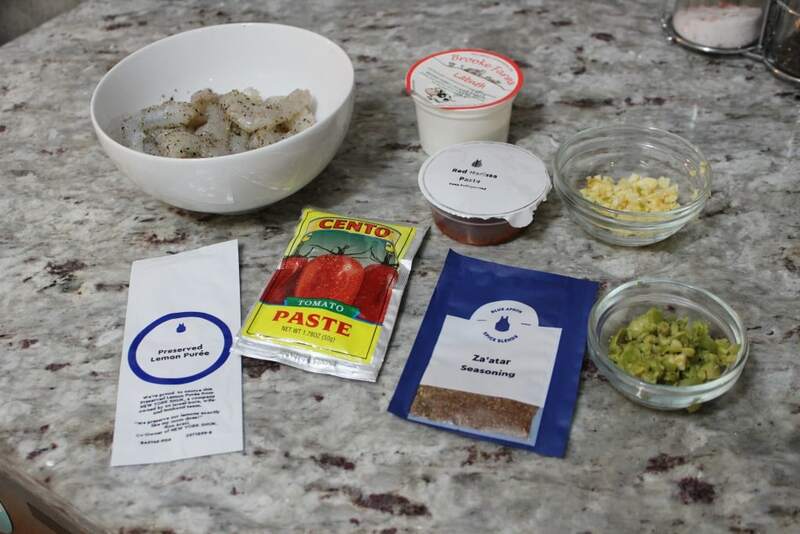 We get Blue Apron every week on our own dime, and then I occasionally partner with them for a sponsored review every few months. For this quarter’s partner post, they challenged me to show appreciation to someone that I love by cooking them a Blue Apron meal! I was originally thinking it might be fun to cook for a friend (I did that once before using a Blue Apron – it’s a great way to make a meal for a friend/have a girl’s night in without dealing with all the planning/shopping logistics), or for my mom, but in the end I decided why not use the opportunity to cook a meal for my best guy, especially since he’s usually the one cooking for me! Matt had a really busy week at work last week, so by Friday he was wiped and I figured it would be the perfect night to let him relax on the couch while I got Riese to bed and then started cooking. It’s hard to get out for date nights nowadays (we are lucky to have my mom babysit on occasion, but we feel bad asking her often), so I figured I could make this meal a special date night in – no babysitter required! 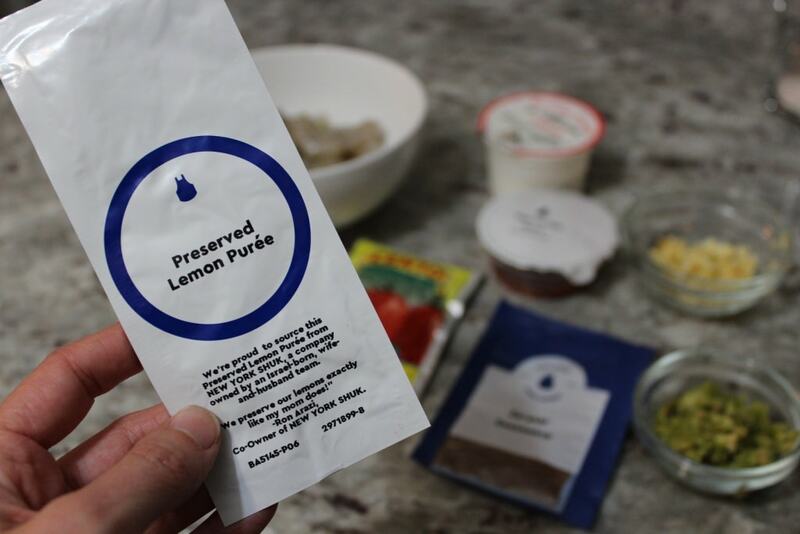 If you haven’t heard of Blue Apron before, it’s a meal subscription box service that delivers farm fresh ingredients to your door (in a refrigerated box, so you don’t have to be home) in exactly the right proportions to make delicious chef-designed recipes at home. 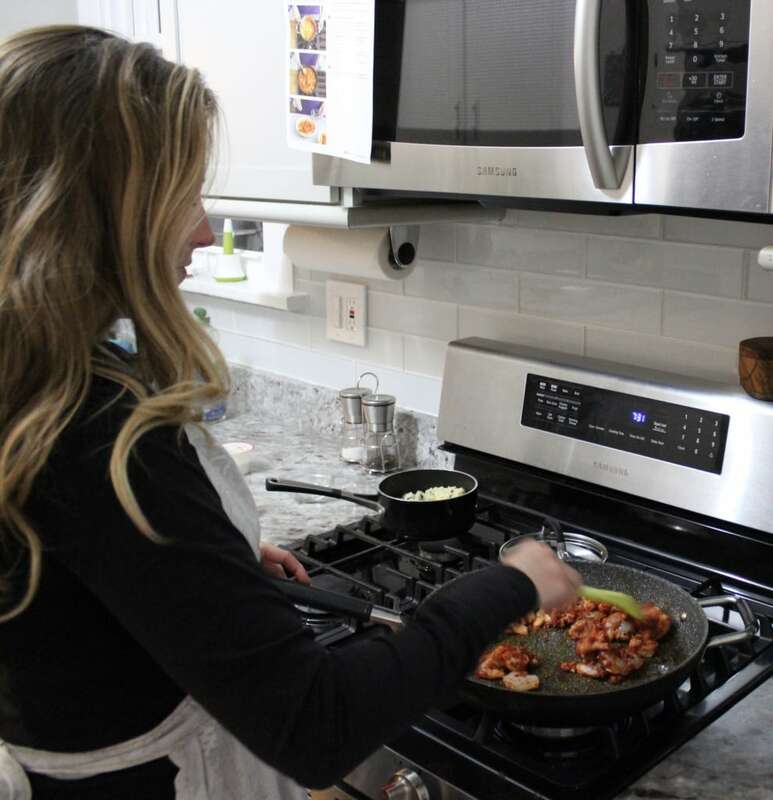 We do the 2 person plan (you can choose 2 or 3 recipes each week, each serving 2 people – they also have a family plan option) every week and love having 3 of our dinners already planned and shopped for! The recipe instructions are easy to follow and their meals are always creative and unique, too – it gets us making things at home that we might not normally think of or try! 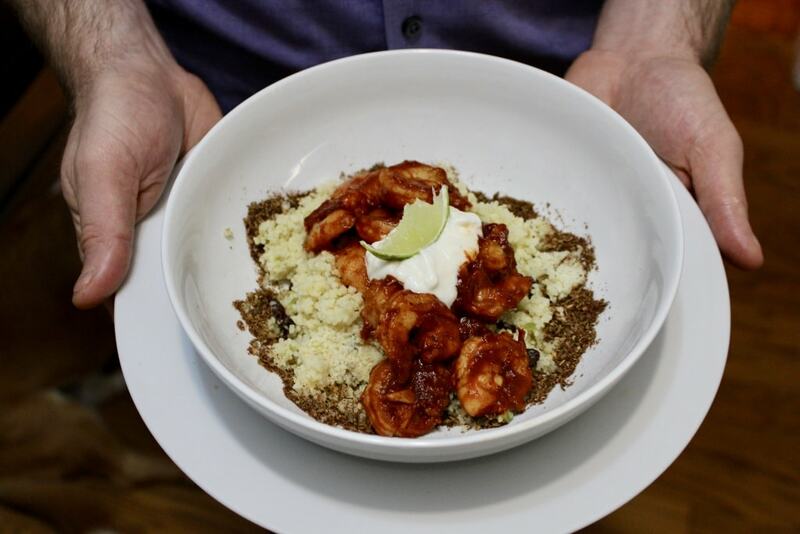 Case in point was our date night in meal: Shrimp in Smoky Harissa Sauce with Couscous, Olives, & Currants (<- get the easy 20 minute recipe to recreate it at home yourself!). Sounds fancy, right?! 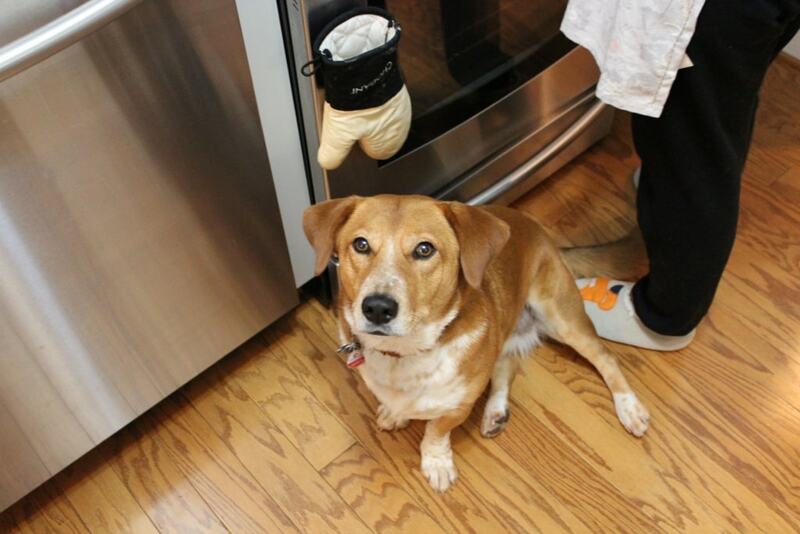 My sous chef (always underfoot) and I got to work. 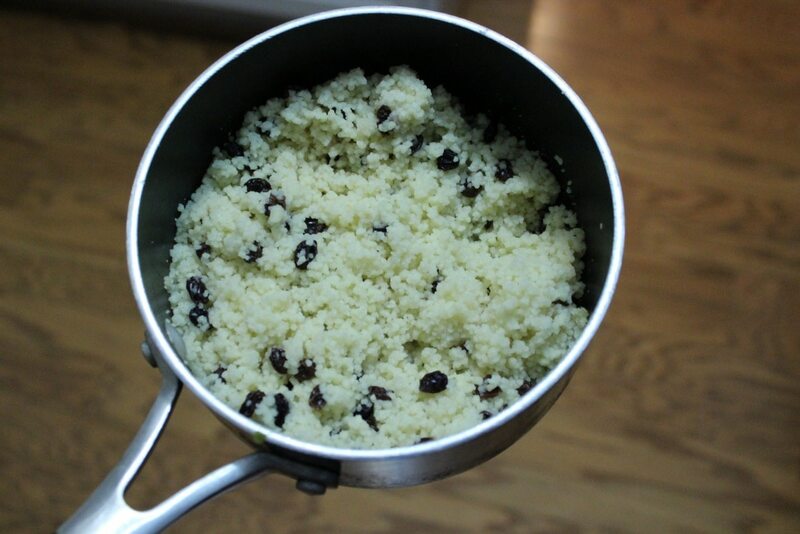 The couscous also got a yummy boost from this cool preserved lemon puree – I love all the unique ingredients that Blue Apron sources! Next up was the shrimp! This was a really fast meal, which I appreciate. 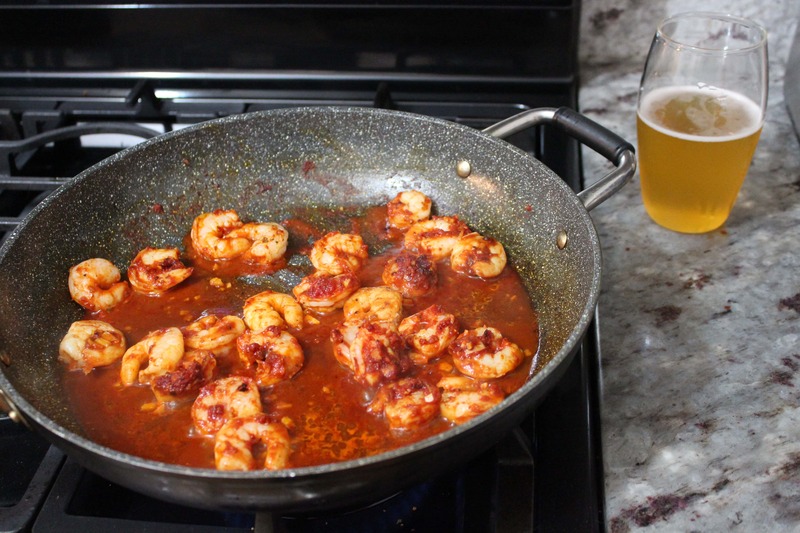 Into a pan went the minced garlic, tomato paste, and harissa paste, followed a few minutes later by the shrimp and a little water. Easy! Matt came into the kitchen to join me for beer o’clock! 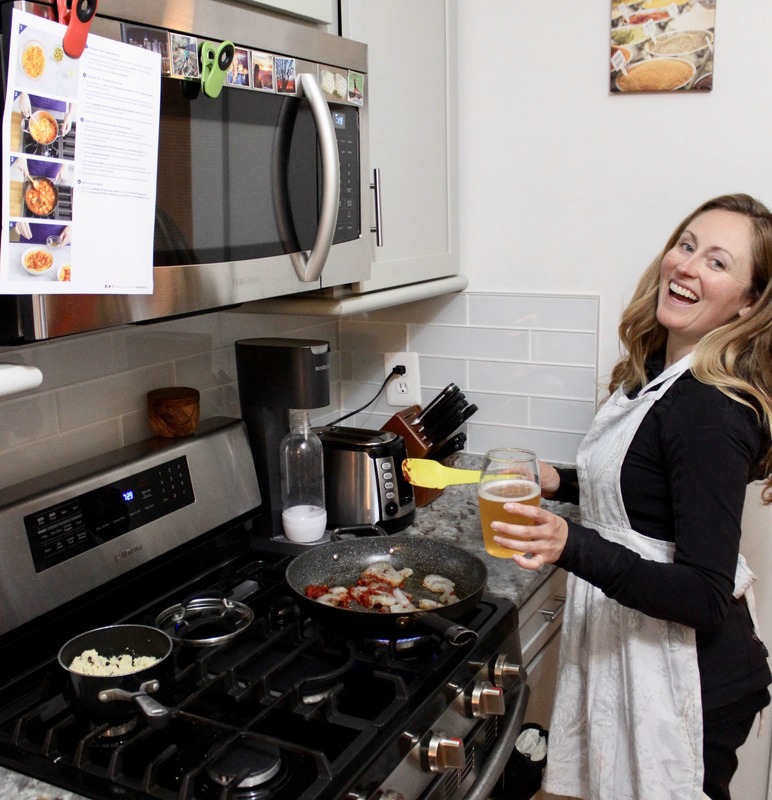 Because cooking is always more fun with a drink in hand, right?! A few minutes later and we were ready to eat! That was easy. 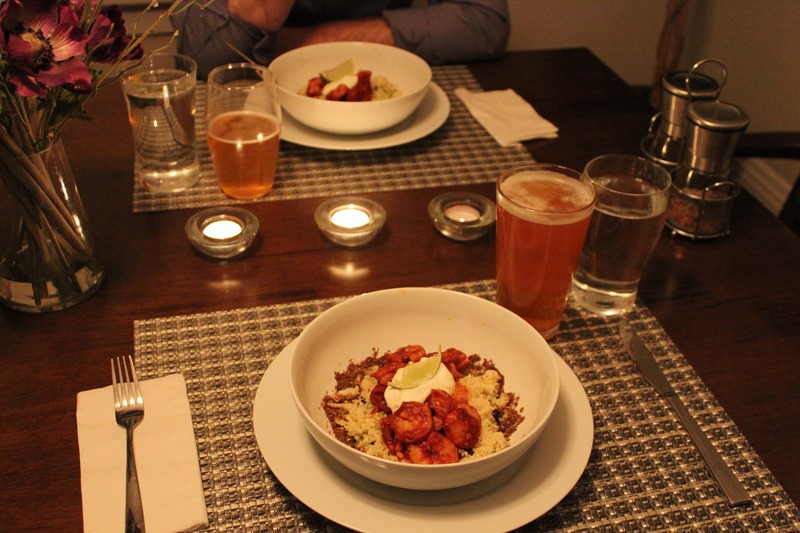 Thank you to Blue Apron for the inspiration behind this date night in – and for making it so easy to execute! Give them a shot yourself – click here to get $50 off your first two weeks of Blue Apron. November and December are great months to focus on gratitude and sharing love. I’d love to know – who would you cook for, and why? Such a sweet gesture! Dining in can be just as special. We just have to go that extra mile, like lighting candles. I now keep our places set with Pioneer Woman placemats and cloth napkins + light a candle often. It does feel special! I love that you do that! I lit candles again for dinner last night… loving that something so simple makes such a big impact! 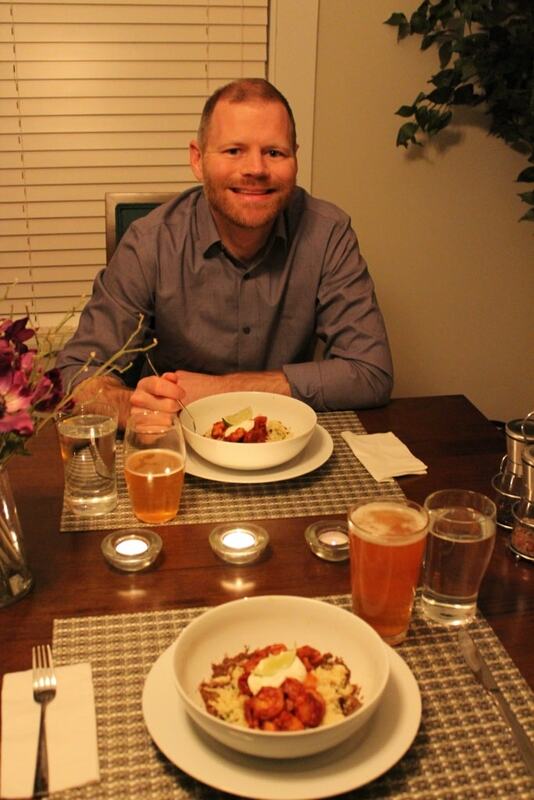 A very nice idea and a great looking meal!